A few weeks ago we compiled some of the finest festivals in the UK to accommodate dance music fans. This week we cast our gaze a little farther afield to look at what audio delights await you in a field, warehouse or tent on the continent. With Summer just around the corner there are no shortage of dance music festivals and at Trackhunter HQ we have picked out a few of Europe's very best. Dance music has seeped into every corner of the globe and places that decades ago would have struggled to have had anything akin to a club night due to the strict authorities now are hosting some of Europe's biggest and best parties. One prime example is over in Hungary where a premier line up can be found at Balaton Sound. The festival started life in 2007 and under various guises linked to sponsorships it has grown in stature as a leading European festival. Featuring a lot of homegrown talent, the festival also hosts the likes of Dave Clarke, Dua Lipa (who played a prime slot at this year's Glastonbury), Hot Since 82, John Digweed, Sasha and Armin Van Buuren. Balaton is another example of the marathon sessions that dance festival goers thirst for with five days of high octane entertainment. There are a multitude of ticket options to chose from depending on how many days you want to attend, with optional VIP options and a ticket to attend their own boat party. Not just a dance music festival but one of the growing number of multimedia focused weekend events taking place across the globe. The idea of an arts festival that incorporates music is far from new, as the world famous Glastonbury Festival is billed as an arts festival first and foremost. Just up the road from the Untold Festival and just a couple of years older it extends its musical boundaries beyond dance to welcome rock, indie and reggae among other genres. This year features Deadmau5, Paul Van Dyk, Moderat, UNKLE, House of Pain, GusGus, DJ Sneak, Clark and MJ Cole among others. Tomorrowland is so epic that it happens over the course of two long weekends and more incredible than that is that it sold out in 64 minutes. Despite that it is worth a notable entry so that you can keep your eyes open for 2018 when tickets go on sale next winter. So if you are lucky enough to have got in early and obtained a ticket you can expect to see Oliver Heldens, David Guetta, Deadmau5, Seth Troxler and Kerri Chandler to name but a very few. As the festival title suggests this is held at the weekend on the Baltic Coast. The website gives an enticing view of the festival from above showing party goers on the beach facing out into the Baltic Sea. A fine array of European artists are booked for 2017 and you will have the likes to Armin Van Buuren, Sub Focus, Alesso alongside the home talents of Ally X Siger and Madison Mars. 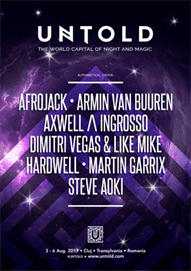 One of Europe's largest indoor and outdoor electro and trance festival that first came to life in 2011. This year's lineup includes Afrojack, Bassjackers, Dillon Francis, Lumberjack, Maeva Carter and Martin Solveig, all by the side of the French river Charente. Another Romanian festival and a fledgling event that is about to deliver its third iteration, Untold takes place in the second largest city in Romania Cluj-Napoca. This year's line up features a diverse lineup including hip hop stalwart Jeru the Damaja, trip hop originator DJ Krush and veteran rap, dub heavyweight beatmakers Asian Dub Foundation all on just the Thursday. Friday and Saturday night goes to another level as Lee Scratch Perry teams up with fellow dub legend the Mad Professor. Whilst turntable duties are lead by a host of big names including Armin Van Buuren, Roger Sanchez, Steve Aoki and Afrojack. Already nominated for European Festival awards, Untold Festival is no doubt on a trajectory to bigger and better things. Set in an abandoned fort perched over the Adriatic Sea it is a festival that brings together the tribes of dub, reggae, hip hop, drum 'n' bass, garage, grime, dubstep, house, techno and electronica. With an superb line up that is second to none you can watch the sun go down to the sounds of Wiley, Goldie, David Rodigan, Congo Natty, Shy FX, DJ Marky and Mr Thing among others. The list goes on and on, with some of the UK, US and Europe's finest all congregating in one superb location. The festivities start on the Wednesday night with an opening concert held in Pula's Roman Amphitheatre starring Dizzee Rascal, DJ Shadow, The Outlook Orchestra Featuring Roots Manuva, Loyle Carner, General Levy, Akala and many more. Held in an abandoned US army base close to the Bavarian Alps, Echelon is now in its ninth year. With a focus on techno and electronica Echelon has over 60 DJs and live acts for you to sink your teeth into. This year's lineup includes Adam Beyer, DJ Rush, Pan-Pot, Ben Klock and Kerstin Eden kicking out the four on the floor beats till the early hours. Live acts include Neelix, Stephan Bodzin and Worakls.